Curl up in front of the 19th century hearth fireplace with a good book or a glass of wine from the Manor cellar. Take a stroll along the scenic Guysborough harbour shoreline taking the waterfront trail which goes from downtown to the harbour mouth. Open the tickle trunk and build a snowman to welcome guests to the Manor. Savour Nova Scotia’s “gold nectar” at DesBarres Manor Inn’s annual Fire & Ice Dinner celebrating the Nova Scotia Winter Icewine Festival on the Valentine’s weekend. Play games in the Parlour Room cocktail bar. All your favourites await you. 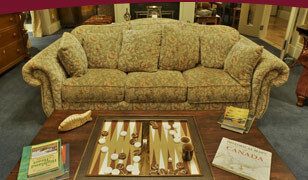 Build a puzzle in the private dining room. Our collection is extensive so stay an extra night. Find the constellation Orion in the night sky. It’s at its brightest. Whatever you choose to do on your winter getaway, DesBarres Manor will renew, rejuvenate and restore. To learn more about all the winter activities on the Authentic Seacoast, click here to go to the Authentic Seacoast website.